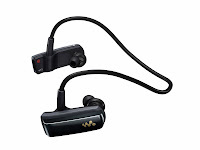 26.2 Quest: Sony's New Wearable Walkman® MP3 Player - Giveaway! 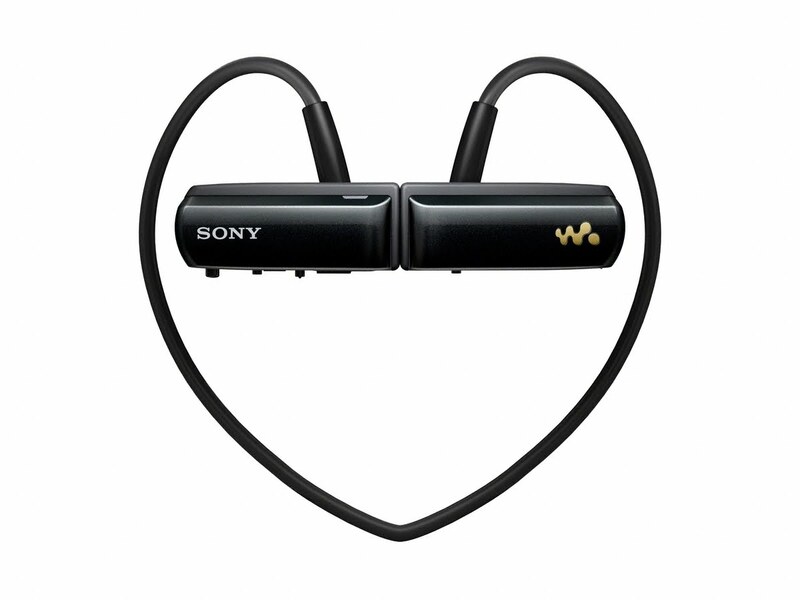 Sony's New Wearable Walkman® MP3 Player - Giveaway! **If you are bored with too many details and you just want to go win, you can jump directly down to the giveaway. But, then again...... don't you want to know what you are going to win??? I know not everybody listens to music, podcasts, or anything else when they run, but I am one of the ones that does. Now, not every time mind you, but more times than not I am listening to something while I am on the run. I have not been bitten by the iPod craze and honestly don't understand the draw (sorry iPod lovers) because I just find my MP3 players so much easier to use all the way around..... and cheaper :) Many times I download my favorite podcast (Daily Audio Bible) while other times I listen to an Audio Book. When I am not listening to one of the above I just listen to the music I have already downloaded to my player. When I run I usually use a small MP3 player that I attach to my arm. I have been very happy with it, but I do tend to go through headphones so often that I only buy the cheap ones that ship from Singapore (do they attach these packages to migrating whales? Why does it take so long for them to get here?). With the way the wire hangs and everything I have to do to keep it from pulling it is inevitable that the wires will eventually pull apart inside and I will be replacing the headphones once again. Considering what I go through with my MP3 player and the constant pulling and fidgeting, I was really excited when I was contacted to review the Sony W Series Walkman® MP3 Player. Brand new and just released about a month ago it sounded like just what I needed. So let me break down my thoughts and experiences with the above points. Design - It is lightweight and it doesn't even look too funny on (click image for larger view). My kids did laugh at me when I put it on, but they are teenagers and they laugh at me anyway. I love the fact that it is water resistant and I don't have to worry about it in the rain, but I will still be worried the first time I run with it in a monsoon. Quick Charge - While I like this feature I have a hard time figuring out if it is running off of a quick charge or a full charge. Since it doesn't have a screen the software has a nice feature that shows the battery life. Easy Music Transfer - I have not tried using it with iTunes. I do have iTunes and buy music from them, but I just don't like the way it handles music and the transfer to a device. I am the type that likes to just drag my music/podcasts directly to the device in the folder structure I want them in. This device works great that way, or also syncs up really nice using Windows Media Player. When I first plugged the device into my Windows 7 machine it immediately launched the software on the device. The only thing it had to install was the drivers which seemed to be no more than what a USB drive would install. The little application that runs is handy and lets me launch Windows Media Player, open the drive directly to drag files back and forth, or access the limited settings. It also shows the used space and a battery indicator. When I first put them on I was a bit worried that they wouldn't stay put while running. I am not your most fluid runner so I sometimes have a lot of up and down motion. I was pleasantly surprised at how well they did stay put both during a run as well as while mowing the lawn. I did not get to run with it a bunch. Most of my runs are early in the morning around 5:00 am and when I run with an MP3 player I run with just one ear-piece so I can hear my surroundings. If the Sony W Series Walkman® MP3 Player was detachable so you could use only one side (similar to a Bluetooth device) it would be the ultimate device for me. Now, I realize I am probably kind of alone with this need/desire, but I value my safety more than I do stereo sound. The functioning of the device while listening to it is a little tricky until you get accustomed to it. Without a screen it relies totally on tags on the MP3 files or your playlist on how it plays the files. What I found difficult was that it was hard to tell if the device was on and paused, or if it was turned completely off. It does have some features with skipping ahead or back, but since I don't fully understand them yet they just confused me. The audio quality was very good for such a compact device, but I can't say that I am really a sound connoisseur either (most of my TV's are sill mono). When taking the device off they fold up nicely with a magnet that snaps them together as seen in the second picture (click for larger image). There also is a little snap piece that I think is designed to hold it together but I really don't understand it's purpose, nor the fact that they choose to block the USB plug when it is attached so you can't charge it or load it. All in all I really like the device and if I ran mostly in the light I would probably use it all the time. I am sure it will get easier to use once I learn completely how it functions, even though right now it can be a little frustrating. 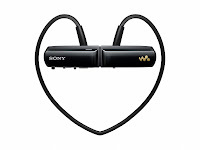 The Sony W Series Walkman® MP3 Player has an SRP of $60 and is available at Sony Style retail stores & other authorized retailers nationwide, although since it is so new I didn't see this specific model in very many places when doing a search. I am sure it will become more available after it has been out for a while. Would you run with one of these? Well, Sony is going to give you a chance to do just that. I am sorry, I have been talking about this giveaway on Twitter (follow me) for some time now. I was in the middle of totally rebuilding the design of my blog and needed to get it to a usable point before posting this review and giveaway. It is not finished yet and I have a lot to do over the next couple weeks so keep coming back to check out the progress. So, I know what you are thinking..... what must I do to win one of these cool devices? There are multiple ways to get entries into the giveaway. Blog - Do you have a blog? If you have a blog and want to blog about this giveaway I would be most grateful. Just link back to this direct post somewhere in your post and put link to your blog post in a comment on this post and you will be entered once again. Blog - Just link back to this post and you will be all set. ***Remember to post a comment here letting me know what you have done so your entry can be counted. Because the three forms of entry are based on getting the word out and not primarily to build my following these next opportunities are not going to give you any additional entries. That doesn't change my gratitude one bit, nor change the smile that it will put on my face. The giveaway will be open until May 28th @ 11:59 PM EST. I will probably be a little forgiving and take all entries until I get up Saturday morning, but there is no guarantees after midnight. I will then tabulate the entries and pick a winner via random selection. I am sorry the MP3 player can only be shipped to the USA. Thanks for stopping by my blog, while you are here, what do you think of my new design? Stop by my last post and give me your feedback. It is not yet finished, but is starting to look and feel like I want it to. If you haven't yet stopped by my most popular post, you need to stop by my Runners To Follow On Twitter post and find some new running friends. While you are there add a post with your twitter id and get ready to welcome some new running followers. That's it for now, Good luck! Please remember to post a comment to let me know what you did, I do not have a way to know to go look for the entries but I know people are using the Facebook button because the count is going up. Hey Tim! Love the new layout. I "liked" your site in Facebook. posted on Facebook. tweeted and blogged. Dana Hunter. I posted about the giveaway on my personal FB page and my I Have Run page!! Posted on Facebook. Working on a blog entry now, so I'll add your link there as well. Finally finished my blog post, and included a link to your giveaway. posted on FB and sent a tweet! liked you on fb. you may be a gift from (choose your own deity), because this is exactly what i've been wanting for years!!!!!! i'm getting a pair of these things no matter what. free would be sweet! it's also posted on my status, and i'm letting all my running friends know. i am uber excited!!! I don't have a blog though. I hope 2 out of 3 is enough! Posted on www.unlikelyrunner.com Awesome MP3 player and thanks for the contest! I will post the winner soon. This wearable walkman from Sony is cool but I would not trade my iPod for anything else. I have heard that there are charging issues with these, Amazon reports it to be alarmingly widespread. Get me an iPod instead.